I am the father of beautiful twin baby girls. In a few weeks, they will be a year old. They never cease to amaze me with all they can do and how much they make me laugh. I’ve learned so much since I was blessed with them. 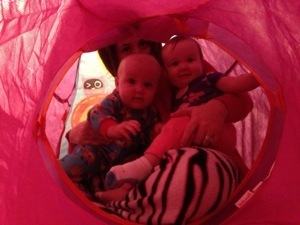 One of our daily rituals with the girls involves a polyester fabric tent that their uncle gave them for Christmas. They like to play a game that usually takes place between bath time and bedtime. One of the girls usually crawls into the tent and waits for somebody to come in and “get” her. They become overwhelmed with excitement when we crawl in after them. They love it the most when I climb into the tent with them. It’s a little small for me, so my feet wind up sticking out the bottom of the tent. They will sit in my lap and wait anxiously for mommy to come and “get” them. As soon as she crawls in with a playful yell, they both giggle and climb into my arms and up into my chest. It’s a fun game to them, but they find comfort in daddy’s arms. As Christians, it’s comforting to know that we can find refuge in our Heavenly Father’s arms. No matter what comes our way, we can find security in God’s arms. Romans 8:39 says that nothing can separate us from the love of God which is in Christ Jesus our Lord. What evil threatens you today? Is some temptation weighing heavy on your resolve? Is your health facing a questionable future? Are your relationships near the breaking point? These and other circumstances often come to drive us into the arms of God. We may have drifted to far from His loving embrace and He longs to hold us close once again. Do not refuse Him. Climb into His arms and find rest. I’ll never forget these times we share in the tent with our girls. Eventually they’ll outgrow the tent, but I’ll always hold the memory close as a reminder of the love and protection of my Heavenly “Daddy.” He ever awaits to embrace us.